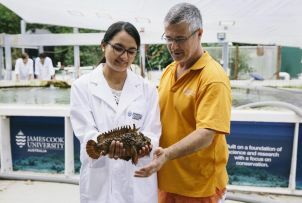 James Cook University recognises and celebrates research excellence via number of awards and programs annually. These include Advisor of the Year Awards, Dean's List and Dean's Award for Excellence and the Celebrating Research program. Come join us to celebrate and present the awards at our inaugural Awards event. This event will be catered so please register your attendance here. The Dean's List and Dean's Awards for Excellence recognise excellence in Higher Degree by Research candidature. Recipients have normally been commended by the independent expert examiners as having made substantial contributions to their field of research. JCU recognises and celebrates research excellence with an annual program of events. Celebrating Research @JCU was introduced in 2009 with a view the improving the profile of research and helping to build institutional capacity. The celebration includes events such as the My Research in 3 Minutes Competition, a national competition founded by The University of Queensland.